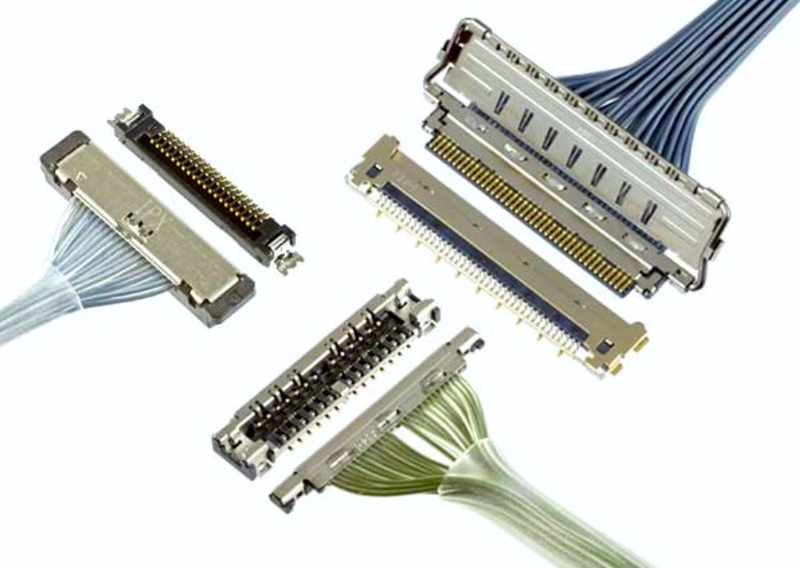 This week’s Product Roundup highlights wire-to-board connector products for industrial, datacom, telecom, military, aerospace, consumer electronics, and medical applications. Amphenol ICC ‘s Minitek® Pwr Connector System offers a comprehensive range of flexible interconnect solutions for power applications. The system is available in wire-to-board and wire-to-wire configurations with 2.50mm, 3.00mm, 4.20mm, and 5.70mm pitches, fully-polarized, scoop-proof housings, low-insertion-force mating for improved durability, and a positive locking mechanism with thumb latch operation. Additional options include a dual-row blind mate interface with vertical and through-hole terminations, Minitek Pwr High-Current Connectors, and Minitek Pwr Hybrid Connectors, which support power and signal applications with a flexible, modular design. One solution in the range, the Minitek Pwr 3.0 High-Current Connector (pictured), is available in single- and dual-row versions rated for up to 12A per contact, 250Vrms, 20–16AWG, 100 mating cycles, and operating temperatures extending from -40°C to +105°C. Ideal for use in high-current, power-dense applications in the telecom, datacom, medical, military, and consumer electronics industries, including 1U rack, generic telecom, and WiMax boxes, interface converters, rack-mounted and blade servers, computers, household appliances, defibrillators, ultrasound equipment, patient monitors, hospital beds, chemical detection systems, and radar systems, the series features fully polarized housings, isolated terminals, high retention force, positive locking with thumb latch operation, interchangeable hand crimping and terminal extraction tools, glow wire compatibility, and compliance with UL94 V-0, RoHS, and lead-free requirements. AVX Corporation ’s 9176-800 Series low-profile insulation displacement connectors (IDCs) reduce the Z-axis height of the next-lowest-profile insulated IDC connector, the 9176-400 Series, by 1mm, reduce the total overall volume of the Standard 00-9176 Series IDCs by more than 50%, and are the first industrial IDCs available in a 2.55mm profile. Designed to connect discrete 22–26AWG solid and stranded wires and leaded components to PCBs, or to connect PCBs together in a daisy chain configuration, the IDCs are available in one to four positions in each wire gauge and deliver high-reliability power and signal connections in space-constrained, harsh-environment industrial, medical, and transportation applications. They are rated for 300V, 4–6A, and operating temperatures spanning -40°C to +125°C, have redundant, fatigue-resistant phosphor bronze contacts that achieve gas-tight, cold-welded wire connections compatible with potting and overmolding encapsulation processes, enable simple, single-step termination, and are compatible with automated pick-and-place assembly. TE Connectivity ’s Universal MATE-N-LOK Connectors are available in wire-to-board, wire-to-wire, and wire-to-panel configurations rated for 30–10 AWG wire and up to 600VAC/DC and 19A. The series features intermixed combinations of pins and sockets in the plug and cap housings to achieve excellent electrical performance in a 6.35mm-pitch (0.250”-pitch) design in addition to positive polarization, positive locking, rear cavity identification for easy, error-resistant assembly, and removable tin- or gold-plated contacts for system flexibility. Additional options include circular, flanged, bulkhead, sealed, and colored housings in various materials for broad suitability in applications including appliances, lighting systems, HVAC equipment, and low power and signal applications. The series offers 2–10 inline positions, 2–15 wire-to-board positions, 1–15 wire-to-wire positions, and 6, 9, 12, or 15 matrix positions, as well as Commercial MATE-N-LOK variants, which have a 5.08mm (0.200”) pitch and are rated for 250VAC/DC and 19A, and glow-wire-compatible variants that meet UL94 V-0 and IEC 60335-1 5th edition requirements. Newark, An Avnet Company , stocks the Spot-On Wire-to-Board (WTB) Connector System from Molex — the industry’s first surface-mount WTB connector system compatible with potting materials. Ideal for use in home appliances that require protection against water ingress and signal interference, including air conditioners, microwaves, refrigerators, stoves, shower toilets, water heaters, washers, and dryers, the Spot-On Series provides improved process capabilities and mechanical reliability at a lower processing cost than through-hole connectors. Features include center PCB nails that absorb the stress caused by the thermal expansion and contraction of potting materials to protect the SMT solder joints, inner positive locking mechanisms that save space and prevent both latch breakage and wire tangling, fully polarized and color-coded receptacle housings that ensure foolproof mating, high profile plug housings that prevent potting materials from leeching into the housing, TPA retainers that facilitate the secure insertion of crimped terminals, and SMT mounting tails that facilitate automated assembly and reduce manual labor processes. The series offers single- and dual-row solutions with UL94 V-0 headers, housings, and retainers, and tin-plated copper alloy contacts on a 1.5mm or 2mm pitch. Solutions with a 1.5mm pitch accept 24–28AWG wire and are rated for up to 100V and 2A, solutions with a 2.0mm pitch accept 26–22AWG wire and are rated for up to 250V and 3A, and both 1.5mm- and 2.0mm-pitch solutions allow for a maximum potting height of 5.0mm and are rated for up to 30 mating cycles in operating temperatures extending from -40°C to 105°C. Smiths Interconnect ‘s MHD Series high-density PCB connectors for commercial aerospace, space, and defense applications including avionics, engine, power distribution, and radar systems exhibit rugged resistance to high shock and vibration and are ESA qualified to ESCC 3401/065. They are available in wire-to-board and board-to-board configurations with rugged metal shells that help eliminate contact fretting, reduce wear rates, and avoid system failure and downtime and with up to 400 mixed signal, power, and coaxial contacts that enable improved flexibility and broad application suitability. The series employs proven Hypertac® hyperboloid contact technology to deliver unrivalled performance in terms of reliability, durability, contact force, and contact resistance and is rated for 3A signal, 15A power, 200V operation, 5,000 mating cycles, and operating temperatures extending from -55°C to +125°C. Additional features include an aluminum alloy frame, UL94 V-0 insulators, gold-over-nickel-plated copper alloy contacts, 1.0mm or 2.00 pitches, nickel-plated brass or stainless steel guides, and four termination styles: straight and 90° through-board solder, surface-mount, and surface-mount straddle. Phoenix Contact ’s Levered Power Combicon (LPC) PCB Connectors are the first lever-actuated PCB connectors to offer a 7.62mm pitch. Featuring up to four power and four signal connections in a single PCB terminal block and lever-style actuators that enable quick, easy, and intuitive tool-free termination and release, the series offers space, cost, and time savings in a broad range of industrial, telecommunications, automation, measurement and control, drive technology, and transportation applications, including servo drives and frequency inverters. It also features touch-proof mating headers per IEC/UL 61800-5-1 for improved safety and its push-in capability is compatible with both solid and ferruled wires. Radiall offers a comprehensive range of rack and panel connectors for military, aerospace, industrial, medical, space, telecom, and test and measurement applications. Solutions include the NSX Series ARINC 600 Connectors, which enable the widest range of mix-and-match solutions, including a receptacle that provides up to 20% cost saving and 10% weight savings without compromising on reliability or performance; the DSX Series ARINC 404/SAE AS 81659 Connectors — a proven solution used in most major civil and military avionics and available in several versions; the EPX™ Series EN 4644 Connectors, which feature a modular, lightweight, and high-density shell that can be used on standalone PCB architecture; and the MPX Series EN3682/MIL-DTL-83527 Connectors — a ruggedized version of the ARINC 600 solutions that combines a robust, high-density construction with high conductivity corrosion resistance, and enhanced sealing. ACES North America developed a wire-to-board (WTB) insulation displacement contact (IDC) connector for smart meters. Designed to provide higher reliability performance than crimp-type wire-to-board connectors while still operating within cost constraints, the 51308 and 51309 Series IDC connectors deliver high-reliability power and signal transmission in a subminiature form factor ideal for use in high-density applications. The WTB IDC solution allows the unique single-row contact to be easily inserted into the housing, has a positive locking mechanism with both audible and tactile confirmation of proper mating, and does not require any dedicated tools for termination. Autonomous manufacturing processes help keep costs low and lead-times short and reliability testing reports are available upon request. Samtec ’s rugged, micro-pitch SFSS and SFSD single- and dual-row discrete wire cable assemblies feature proven Tiger Eye™ contacts on a 1.27mm-pitch and achieve durable, high-reliability connections in industrial, military, aerospace, medical, telecom, and datacom applications ranging from industrial automation equipment to computers and peripherals. The series’ heat-treated, three-finger beryllium copper (BeCu) contacts have smooth, flat mating surfaces and offer superior spring properties, low contact resistance, and extended plating lifetimes in even high-cycle applications. Both series also have shrouded, polarized, and keyed connectors available with up to 100 I/Os and compatible with 28 and 30AWG wire. Additional options include retention latches that increase unmating force by 5–10 times depending on the pin count, optional screw-downs, PVC or high-temperature Teflon cable, and countless wiring options to maximize design flexibility. Both series are available as either components or complete assemblies, although the latter is much more popular, and hand tools and application tooling are also available. Cinch Connectivity Solutions ’ Dura-Con™ family offers a wide range of rugged, high-performance, microminiature connector solutions for wire-to-board, wire-to-panel, and wire-to-wire connections in space- and weight-constrained military, aerospace, industrial, and medical applications including munitions and avionics systems, downhole oil and gas equipment, test equipment, and miniaturized data processing equipment that requires shorter signal paths. The heart of the family — which is available in Micro-D, Microedge, and Strip subseries — is the Dura-Con twist pin contact, which is comprised of seven wires wrapped around a three-wire core, compressed to increase the diameter and achieve seven points of socket contact, and built to maintain electrical conduction between pins and machined sockets in even high-shock and -vibration environments. Dura-Con Micro-D connectors are designed and tested to the MIL-DTL-83513 specification, are available in high-temperature, hermetic, commercial, mil-spec, and expanded beam fiber optic variants, and are one of the most widely used 1.27mm-pitch (0.05”-pitch) connectors on the market. Dura-Con Microedge micro rectangular card-edge connectors are designed and tested to MIL-C-55302 requirements and offer several termination options, and Dura-Con Strip micro rectangular connectors are extremely thin and lightweight. Heilind Electronics stocks TE Connectivity’s Miniature SlimSeal Connectors, which provide space-saving, IP67-rated dust- and waterproof connections ideal for use in harsh-environment wire-to-board and wire-to-wire applications exposed to high humidity, including outdoor lighting, digital signage, parking garages, public transport stations, commercial refrigeration lighting, kitchen appliances, HVAC and security equipment, communications systems, and trailer lighting. The series is available in two- and three-position configurations with UL94 V-0 LCP housings and tin-plated copper alloy contacts and features robust press-to-release spring latches that prevent accidental unmating, preassembled rubber seals that reduce assembly time, and four housing colors that enable easy identification and assembly. It is rated for 22–18AWG, 3–5A depending on AWG, a maximum of 250VAC working voltage in wire-to-board configurations and a maximum of 400VAC in wire-to-wire configurations, 30-cycle durability, and operating temperatures extending from -40°C to +105°C. JAE ’s FI-R Series Connectors for high-speed internal serial transmission are designed to provide easy mating, durability, and flexibility, and are ideal for LVDS, HDMI, and PCIe applications in the datacom, medical, and consumer electronics markets. They have a compact design with a 0.5mm pitch, a low 3.8mm connector height, and a mechanical lock to prevent mismating and accidental unmating, and are available with 21, 31, 41, or 51 positions. Plugs have tin-plated copper alloy shells with large mating guides to support quick, easy, and accurate mating, as well as heat-resistant plastic insulators, stainless steel lock springs, and gold-plated phosphor bronze contacts that are rated for a maximum of 0.7A each and have tin plating in the terminal area. They are designed to enable 36–30AWG discrete wire crimping or 40AWG fine coaxial wire soldering for broad application suitability. Receptacles have stainless steel shells with solder hold-downs for strong PCB retention, heat-resistant plastic insulators, and gold-plated copper alloy contacts that are rated for a maximum of 0.8A each and have tin plating in the SMT terminal area. They also have optional shells, straight and right-angle orientations, and a common footprint. The series is rated for 500VACrms dielectric withstanding voltage, a minimum of 100MΩ insulation resistance, a maximum of 40mΩ contact resistance, and operating temperatures extending from -40°C to +80°C, and is recognized as a VESA standard connector for the LCD TV interface. I-PEX Connectors offers a wide range of micro-coaxial connectors and cable assemblies designed to provide high-data-rate signal transfer over long distances. Solutions support transfer speeds up to 100Gb/s (25Gb/s per line) and offer compatibility with standards including USB 3.1 Gen 2, PCIe 2.0, 3.0, and 4.0, eDP HBR2 and 3, SATA 3.0, HDMI 2.0, Thunderbolt 1, 2, and 3, and IEEE 100GbE. Cables in the micro-coaxial product portfolio have center conductors, dielectric cores, and outer conductors that are suitable for matching, stabilized at a specific impedance to achieve low return loss, and shielded to help reduce external noise and/or crosstalk between signal lines. Connectors in the micro-coaxial product portfolio are available in horizontal, right-angle, and vertical mating configurations with 0.25mm, 0.3mm, 0.4mm, and 0.5mm pitches, have a metal EMI shield that goes over the entire connector to provide interference protection, which grows ever more critical as data rates climb, and have locking mechanisms to ensure secured connections and prevent accidental disconnection. To create complete harness assemblies, users simply align prepped cables (i.e., cable sub-assemblies) to the plug housing, solder the center conductor of the cable to the plug contact, place the lock, and solder the ground bar and shell. Since the ground bar is conducted with all cable outer conductors, it is possible to conduct the entire connector system (i.e., both the plug and receptacle) and achieve good grounding characteristics by simply soldering several points between the ground bar and shell. Micro-coaxial cable assemblies can be made with different cable diameters, can address both signal transfer and power supply needs with a blend of micro-coaxial cables and discrete cables, and can include ground fingers/tabs on the ground bar for direct plug attachments. These flexible assemblies are ideal for use in space-constrained electronics devices including notebook PCs, moving cameras on drones, and other equipment that incorporates Wi-Fi, GPS, and LTE capabilities.